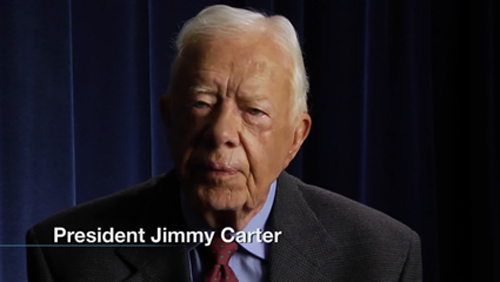 International Film Festival for Peace, Inspiration and Equality (IFFPIE) chooses The 39th U.S. President, Jimmy Carter as the Man of Inspiration 2015. This award is given to the President who in the 2002 received Nobel Peace Price because of his contribution to peace. The founder and director of IFFPIE, Damien Dematra says that he hope by giving this award to President Jimmy Carter will inspire all generations to live in peace. President Jimmy Carter has founded The Carter Center dealing with health issues, world democracy, women’s and children's rights and Habitat for Humanity. The 39th President was involved in the movie Life Under Siege, directed by Dr. Miriam Abu Sharkh. The film is about Director Miriam Abu Sharkh's travels to Gaza, her investigations of the smuggling tunnels to Egypt, and her relationship with her father and half siblings, whom she is only able to visit by the result of monumental social movements. This film was made to raise public awareness of the Palestinian crisis in Gaza and its effects on family, love, and life. Life Under Siege itself received International Awards of Outstanding Excellence from IFFPIE in category of Documentary Feature. In 2014, IFFPIE chose President Jokowi (The President of Indonesia) as Man of Inspiration 2014. The President was chosen because he has inspired all generations in every aspects.This festival is fully supported by People Creative Council (DKR), i-Hebat International Volunteer, Russian Culture Center, World Film Council, Film Festival Alliance, Cinema XXI, Care for Children Foundation and Radio Republic of Indonesia (RRI) as media partner for national and international news.